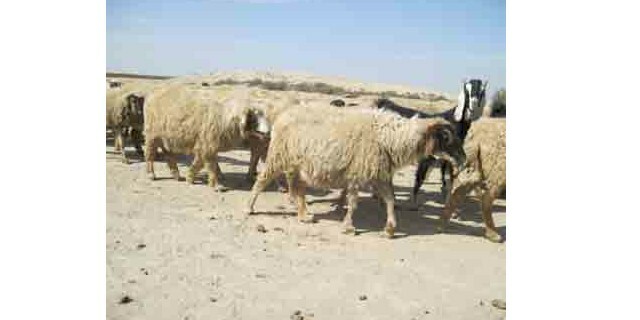 Cholistani sheep are from Pakistan. Though they grow wool, they are raised primarily for meat. They have a black to brown head and ears with a white body. They have stubby, small ears and a long tail. Mature rams weigh 48.5 kg (107 lb) and ewes weigh 34 kg (75 lb). Their average height at the withers of mature rams is 75 cm (30 in) and ewes is 66 cm (26 in). At birth and on average, rams weigh 3.5 kg (7.7 lb) and ewes weigh 3.0 kg (6.6 lb). Ewes have an average litter size of 1.05 lambs. During an average lactation cycle of 110 days, ewes produce 45 kg (99 lb) of milk. From 1986 to 1996, the world population of the Cholistani decreased from 275,964 to 33,025 respectively. In 1986, there were an average of 120 per flock and artificial insemination was not used.